Viggo Peter Mortensen Jr. (/ˈviːɡoʊ ˈmɔːrtənsən/; Danish: ; born October 20, 1958) is an Danish-American actor, author, photographer, poet, and painter. He has Danish ancestry and was a resident of Venezuela and Argentina during his childhood. He is the recipient of various accolades including a Screen Actors Guild Award and has been nominated for three Academy Awards, three BAFTA Awards, and four Golden Globe Awards. Mortensen made his film debut in a small role in Peter Weir's 1985 thriller Witness starring Harrison Ford and has appeared in several notable films since, including The Indian Runner (1991), Carlito's Way (1993), Crimson Tide (1995), Daylight (1996), The Portrait of a Lady (1996), G.I. Jane (1997), Psycho (1998), A Perfect Murder (1998), A Walk on the Moon (1999), and 28 Days (2000). Mortensen at the 2016 Cannes Film Festival. 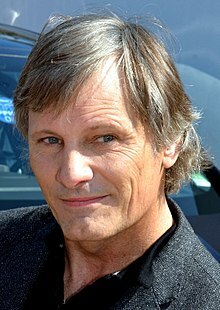 Viggo Peter Mortensen Jr. (/ˈviːɡoʊ ˈmɔːrtənsən/; Danish: [viːɡo ˈmɒːdn̩sn̩]; born October 20, 1958) is an Danish-American actor, author, photographer, poet, and painter. He has Danish ancestry and was a resident of Venezuela and Argentina during his childhood. He is the recipient of various accolades including a Screen Actors Guild Award and has been nominated for three Academy Awards, three BAFTA Awards, and four Golden Globe Awards. Mortensen's first film role was in The Purple Rose of Cairo (1985), but his scenes were deleted from the final cut. His first onscreen appearance was playing an Amish farmer in Peter Weir's Witness . He was cast in Witness because the director thought he had the right face for the part of an Amish man. He had also been simultaneously cast for another role as a soldier in Shakespeare in the Park's production of Henry V, but he decided to turn down that one for the film because he wanted to try something new. He credited that decision and the very positive experience on the film as the start of his film career. Also in 1985, he was cast in the role of Bragg on Search for Tomorrow. Mortensen's 1987 performance in Bent at the Coast Playhouse, Los Angeles, won him a Dramalogue Critics' Award. Coincidentally, the play, about homosexual concentration camp prisoners, was originally brought to prominence by Ian McKellen, with whom Mortensen later costarred in The Lord of the Rings. In 1987, Mortensen guest starred as a police detective on the hit series Miami Vice. With anthropologists Federico Bossert and Diego Villar, Mortensen has written several works related to ethnography of natives in South America, specifically in Argentina, Brazil, Paraguay, and Uruguay. Some of the published books co-authored by Mortensen are Sons of the Forest and Skovbo. 1 2 Stone, Andrew; Carolyn Bain; Michael Booth; Fran Parnell (2008). "Cinema". Lonely Planet Denmark. Lonely Planet. p. 46. ISBN 978-1-741-04669-4. Although [Mortensen] was born in New York and has lived outside of Denmark for most of his life, he retains Danish citizenship. ↑ " Flawed father role a test for Viggo Mortensen". Toronto Star, Michael O'Sullivan, July 16, 2016. 1 2 "St. Lawrence University: Commencement". Stlawu.edu. May 21, 2006. Archived from the original on February 13, 2011. Retrieved February 23, 2011. ↑ "Film: Viggo Mortensen magret seg ned 15 kilo for drømmerollen VG Nett". Vg.no. May 20, 2009. Retrieved May 9, 2010. ↑ Pearlman, Cindy (September 9, 2007). "Superstar Viggo's a serious soul at heart". Chicago Sun-Times. Archived from the original on September 12, 2007. Retrieved November 26, 2018. ↑ "How Viggo Mortensen Got Inside Sigmund Freud's Head". The Wallstreet Journal. 2011. Retrieved June 4, 2018. ↑ Doyle, Macreena A. (2003). "Viggo Mortensen '80 REMEMBERS". St. Lawrence Magazine. St. Lawrence University. Archived from the original on September 24, 2015. Retrieved October 2, 2012. ↑ DePaulo, Lisa. "Why Viggo Mortensen Is Off the Grid". Esquire. Retrieved June 6, 2016. ↑ Brooks, Xan (April 17, 2009). "The happy trails of Viggo Mortensen". The Guardian. Retrieved October 15, 2014. ↑ Lane, Harriet (February 22, 2008). "My mother is very happy about it". The Guardian. Retrieved October 15, 2014. 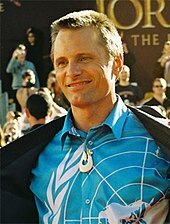 ↑ "Viggo Mortensen". denmark.dk. Retrieved March 28, 2016. ↑ Keith Clark and Jon Mefford (2005). "Between Two Worlds: The Making of Witness". Witness (DVD). Paramount Pictures. OCLC 949729643. ↑ Applebaum, Stephen (December 5, 2002). "Mortensen's battle scars". BBC News. ↑ "Eastern Promises". Chicago Sun-Times. Retrieved December 22, 2007. ↑ "British Independent Film Awards 2007 nominations". British Independent Film Awards. Archived from the original on December 26, 2007. Retrieved January 24, 2008. ↑ "80th Academy Awards". Academy of Motion Picture Arts and Sciences. Archived from the original on January 23, 2008. Retrieved January 22, 2008. ↑ "Rigorous Promotions Have Viggo Mortensen Considering Retirement". starpulse.com. April 6, 2009. ↑ Gilsdorf, Ethan (March 10, 2012). "Viggo Mortensen Speaks: Part 1 of 3". Wired. ↑ Shoard, Catherine (August 6, 2010). "Viggo Mortensen to star in Walter Salles's On the Road". The Guardian. London. Retrieved March 8, 2011. ↑ Lodderhose, Diana (April 22, 2010). "UPI to distribute new Cronenberg pic". Variety. Retrieved February 20, 2011. ↑ "Viggo Mortensen vuelve al teatro con Carme Elias en una obra sobre la capacidad de perdón (in Spanish)". El País. Retrieved November 23, 2011. ↑ "Little press shines with star power". Los Angeles Times. March 3, 2004. Retrieved May 9, 2010. ↑ "Viggo & Buckethead", March 5, 2004, IGN Music". Archived from the original on July 24, 2008. Retrieved August 11, 2008. ↑ "Viggo Mortensen Tells Grads 'Activism Not A Dirty Word'". Newswise. May 21, 2006. ↑ Bysted A/S. "Kongehuset - Forside". Kongehuset.dk. Archived from the original on April 2, 2015. Retrieved March 9, 2015. ↑ "Oscar Nominations 2017: Viggo Mortensen on 'Captain Fantastic' Nod". ABC News. January 24, 2017. Retrieved January 24, 2017. ↑ "10 Questions for Viggo Mortensen". Time. December 17, 2008. ↑ Trucks, Rob (May 20, 2008). "Interview: Exene Cervenka of X". The Village Voice. Archived from the original on February 3, 2014. Retrieved February 2, 2014. ↑ Heller, Zoe (December 2, 2011). "Viggo Talks and Talks". The New York Times. Retrieved February 2, 2014. ↑ "Hollywood'da doğdu Beşiktaşlı oldu - Hürriyet Magazin Hattı". Hürriyet. Retrieved November 12, 2012. ↑ "Guy Lafleur présenté par Viggo Mortensen". YouTube. Retrieved 16 November 2017. ↑ "Best of ABC Online". ABC News. ↑ DV ehf. "Viggo Mortensen kveður Georg Guðna". DV.is. Retrieved August 13, 2012. ↑ "A Visit with Viggo." Sandpoint Magazine. Winter 2004 Edition. ↑ Norton, Ben (November 6, 2015). "'That's tyranny': Viggo Mortensen blasts U.S. militarism, criticises both parties for 'hawkish' foreign policy". Salon. Retrieved November 10, 2015. ↑ "Viggo Mortensen Goes Green: 'I Trust Hillary About as Much as I Trust Donald Trump'". The Daily Beast. 16 July 2016. Retrieved 29 December 2017. ↑ Ronca, Kevin. "The Revolution Televised: Episode 1 - The Awakening of a Generation". YouTube. YouTube. Retrieved 17 November 2018. ↑ McNary, Dave (15 October 2018). "Viggo Mortensen to Star, Make Directorial Debut in Family Drama 'Falling'". Variety.